Whether you are a small or big business, advertising your business by using various promotional signs is an important marketing tool. Depending on your size and budget, you’ll find the following options to be very useful. There are three good ways to incorporate signs into your marketing plan: billboards, perforated window film and street signs. Each of these advertising methods requires that you give some thought as to how effective you wish to utilize them. It is not as simple as it may seem. For one thing, before you decide which methods you wish to use, you need to consider exactly what you want your sign to achieve. For example, a restaurant business has very different marketing needs than a company that sells building supplies. Different types of advertising signs can be used to attract new customers, promote special sales or create a strong brand identity. Ideally, you want to design a sign that gets across your main message in a strong way that quickly captures attention. Most people passing by are only going to spend a moment or two glancing at your sign. Therefore, you want to make sure that it is easy to read and understand to a wide range of people. Billboard advertising has been around for decades. Even though advertising has come into the digital age, the simple billboard method of promoting products and services still provides companies with a highly effective promotional tool. Millions of dollars are spent each year on billboards because they offer a way for a company to be seen by a large number of people. Billboards range in size from small ones that fit on a public bench to large signs that tower over street corners or roadways. Many companies do not consider billboards because of their reputation for being expensive. 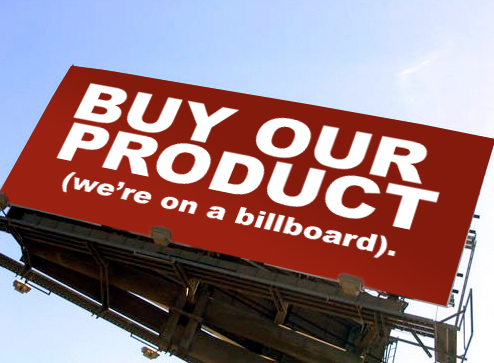 However, in reality, billboards can range from $700 to $2,500 per month. This is well within the range of the monthly advertising budget for many companies. The real consideration when designing a billboard is how simple or fancy you want to get. A simple sign can involve using large colorful lettering with a catchy advertising message. Graphics would also be very simple or include the company logo. An intricate billboard would feature bold graphics that show a product in a particular light. The more specialty details included, the higher the expense. Billboards get your advertising message out there to a big audience. The downside is that your message may be quickly forgotten if it is not memorable. A newer form of advertising is perforated window film. Since this is slightly cheaper, it’s probably better for small businesses. This is a special material that is placed onto any clear window that creates a stunning instant ad for your business. Your advertising message is printed onto a specially treated vinyl film. This sign could be attached by adhesive to a vehicle or storefront window. The great thing about this technology is that it allows people to see your sign while maintaining an unobstructed view from the other side. When applied to the back window of a vehicle the sign would be readable to the public. However, the driver can still have good visibility through that same window. The downside is that these signs only last about one or two years. The most popular advertising signs used by all sorts of companies are street signs. These are signs that are posted within close vicinity to the business. These signs include banners, hanging posters and a-frames or sandwich boards. Street signs are usually simple and inexpensive. The downside is that they have a limited advertising reach. Frank Gormley recognizes that effective advertising is fundamental to a successful business, whether in the form of window graphics, physical signs, or online ad signs.